LineageOS 15 for Moto E4 Plus (nicklaus) is now available to download via an initial development build. 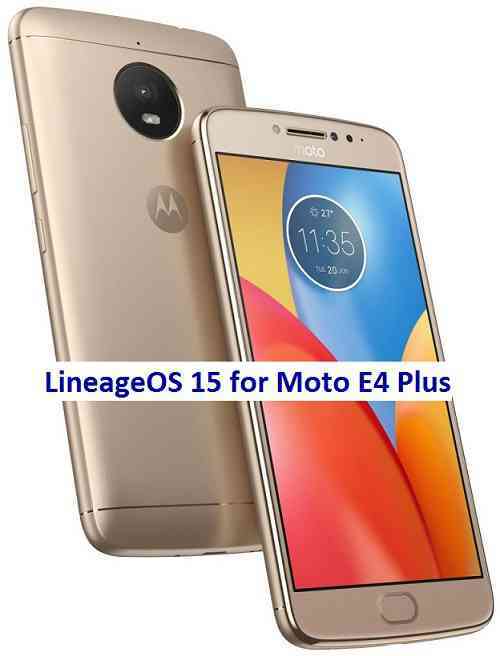 This post provides you the download link to the Android Oreo based Lineage OS 15 for Moto E4 Plus (nicklaus) and guides through the installation process of the same. This LineageOS 15 for Moto E4 Plus is brought to you by developer SamarV-121. THIS IS AN INITIAL BUILD WHICH HAS MAY NOT BOOT AT ALL. HAVE A BACKUP BEFORE FLASHING THIS AND TRY AT YOUR OWN RISK. Installing a custom ROM requires an unlock bootloader for Moto E4 Plus Mediatek phone, which may VOID your warranty and may delete all your data. Before proceeding further you may consider backup all data on the phone. Understand that you are the only person making changes to your phone and I cannot be held responsible for the mistakes done by you. Reboot and Enjoy Android Oreo with LineageOS 15 for Moto E4 Plus. Copy the latest Lineage OS 15 for Moto E4 Plus Oreo ROM ZIP file to the phone. Stay tuned or Subscribe to the Moto E4 Plus (nicklaus) forum For other Android Oreo, Nougat ROMs, LineageOS 15 ROMs, other custom ROMs and all other device specific topics. It’s possible that it has never booted for anyone. hello followed the steps of installation at the bottom of the letter, the rom and the apps are installed without problem, turn on the normal phone but I can not detect the wifi network, turn it on and off alone and no telephone company, there is some solution for that problem. Hello. I have moto e4plus android 7.1.1 xt1773 variant. Can I use this firmware for updating my phone? I think yes you can use this firmware on your xt1733 model.